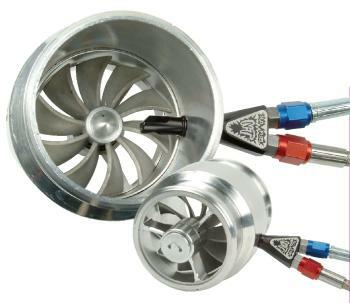 Ny-Trex Typhoon Turbine UNIVERSAL - Dezod Motorsports Inc - Home of the automotive performance enthusiast since 2002. The Typhoon turbine makes ordinary nitrous systems, extra-ordinary. It takes your nitrous system and kicks it into overdrive with boosts in horsepower and torque! Unique design utilizes high pressure nitrous or pressurized air to drive the turbine to create positive induction force. Implements a directional injection nozzle that can be angled to control the speed. Injection nozzle uses different size orifice jets to control the flow rate of the force media. Has ability to utilize a Y mixer nozzle to introduce both the force media (air/n2o) and a catalyst media such as fuel, alcohol or methanol. Passive mode allows passing air to spin turbine fan freely to create swirl effect of air entering the throttle body for improved air flow. Improves horsepower efficiency of existing single nozzle nitrous injection system by as much as 15% and increases torque numbers up to 20% or more. Installs easily within minutes to any aftermarket cold air pipe system.